Round 1: Lara lands a fast left uppercut under the chin of Vazquez. Lara lands three straight lefts. Vazquez comes forward and lands some body shots. Lara lands another straight left behind his right jab. Lara lands a strong body shot while Vazquez is against the ropes. Vazquez is having all kinds of trouble dealing with Lara's hand speed. Lara lands another straight left and is overwhelming Vazquez with his punch output. Round 2: Both fighters exchange blows. A straight left from Lara pushes Vazquez back. Lara takes his time and looks for an opening. Vazquez throws an overhand right, but misses. Lara throws a right jab and then connects with a straight left to floor Vazquez. Vazquez gets up and Lara hits him with a straight left to the body. Vazquez lands a left hook to the body. Lara counters with a left uppercut. Both men exchange shots on the inside. Round 3: Vazquez lands a few punches. Lara lands a straight left. Vazquez lands some body shots with Lara's back to the ropes. Lara counters to the head with a quick combination. Lara lands another straight left. Vazquez counters with a body shot. Lara is using his range, but is also banging Vazquez's body. Round 4: Vazquez lands straight right to the head. A three punch combination lands by Lara. He overwhelms Vazquez with a left uppercut-right hook-straight left. Referee stops the fight. Overall Summary: Lara overwhelmed Vazquez with his hand speed. Vazquez never had an answer for Lara's straight left. 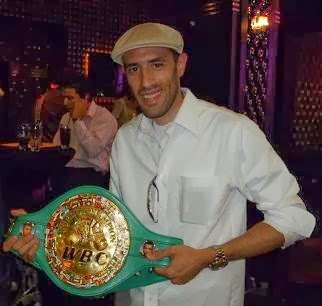 The 26 year old Cuban southpaw threw quick combinations on the inside and controlled distance from the outside. Vazquez's best opportunities in the fight came on the inside. Lara took the lead at times, but also let Vazquez throw his punches and countered effectively. Vazquez's punches were too slow for the slick southpaw. Lara consistently beat Vazquez to the punch. Lara improves to 6-0, 4 KO's.